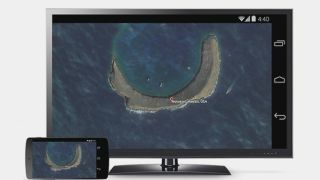 Google has revealed the promised update for its Chromecast app for Android smartphones and tablets that finally enables true display mirroring to TVs. The Chromecast 1.7 boost will allow users to select the "Cast Screen" command from within the navigation drawer and simply select the Chromecast device in question. Google says Nexus device owners will be able to select this option from the quick settings menu. "Now, anything on your Android device will appear on the TV," Google wrote on the official Chrome blog. Examples of using the new feature include throwing photos stored on your phone on a TV screen or checking out your next vacation spot via big-screen Google Earth. The update is currently in beta with Google vowing to roll out to Nexus devices and some Samsung, HTC and LG devices in the next few days. The firm is telling users to look out for update 1.7 in the Google Play store. The update could finally establish Chromecast and the accompanying app as a true rival to the Apple TV and AirPlay platform. Today's announcement certainly levels the playing field.